More and more cities across Canada are adopting a “Complete Streets” model of planning as it becomes increasingly clear that traditional models of road design no longer meet the future needs of our growing cities. While this new approach to city building grows in popularity, some questions arise: how exactly does it differ from past approaches? What are the challenges? And how can we overcome them? As Canada’s forerunner in Complete Streets planning, the City of Calgary serves as a strong case study to answer these questions. Complete Streets policies first started being adopted in Canada about five years ago, beginning with Calgary and followed by cities like Waterloo (2010), Edmonton (2013), Ajax (2013) and Ottawa (2013). The City of Calgary began drafting its official Complete Streets Guide in 2009 as part of a collaborative project to develop a 50-year integrated land use and transportation plan. 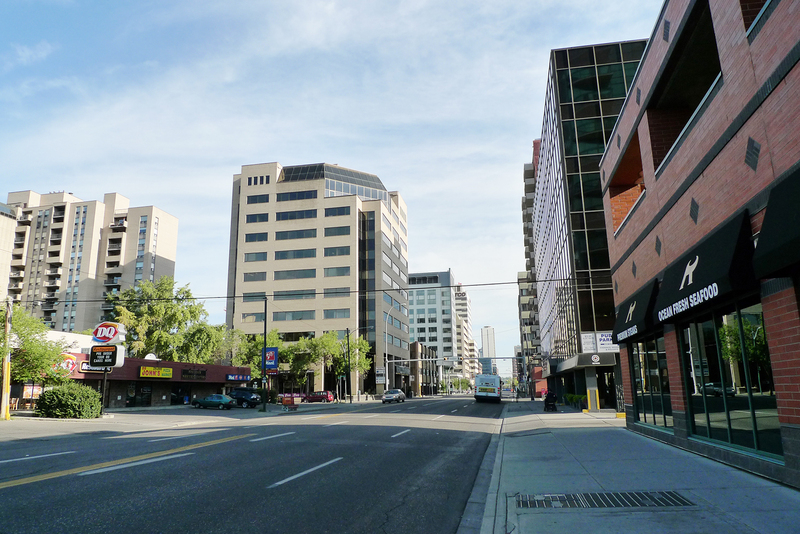 This Guide was a critical step in realizing the City’s 2005 imagineCalgary Plan – a long-range urban sustainability plan for the City and its rapidly growing population. More than 18,000 Calgarians added their voice to imagineCalgary, helping to give shape to its 100-year vision of improving transportation choices, while fostering the health of citizens, communities and the environment. So, what are Complete Streets anyway? Traditional road design, on the one hand, focuses on drivers and driver safety, which results in wide travel lanes, large corner radii, and large setbacks for trees. Although this engineering practice may be appropriate for highway design, when applied to urban street design, it creates an unsafe environment for cyclists and pedestrians, thereby discouraging walking or cycling. Complete Streets, on the other hand, are streets designed for all road users. By designing narrower travel lanes, placing trees and street lights closer to the street, and by reducing the corner radii at street corners to force vehicles to slow down, we create an environment that is safe and inclusive for everyone, regardless of travel mode, age or physical ability. Accessibility features include things like wheelchair ramps, textured urban Braille and mid-block cross walks. The ultimate goal is to provide people with options so they can choose how they want to travel – whether by car, transit, walking or biking – thereby improving health and mitigating traffic congestion. 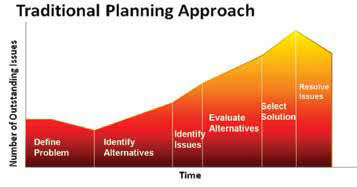 In the past, the City of Calgary’s traditional planning approach to engagement for street design involved circulating a nearly completed design to a group of stakeholders for information (see Figure 1). There was limited opportunity to modify the design to address concerns, which often led to little acceptance for the project to move forward. The Complete Streets (or context-sensitive) approach to street design addresses not just transportation problems, but helps achieve community liveability and sustainability goals. 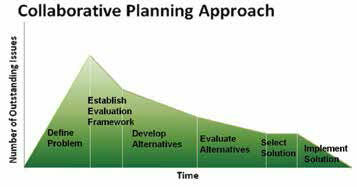 In order to meet these goals, the City of Calgary recognized that a more collaborative planning approach to engagement was needed. The key to this approach is to engage affected stakeholders early on in the process to help identify the community’s vision and priorities for the project. This also allows the group to evaluate design options, identify trade-offs and leads to increased acceptance for the project (see Figure 2). Given that creating Complete Streets involves considering more than one road user, so does the engagement for these projects. Including more than one group of stakeholders allows the project to incorporate a variety of different viewpoints. On the one hand, internal stakeholders can include (but should not be limited to) Roads Operations, Fire Department, Waste & Recycling, Transit, Water Resources, Urban Forestry and Planning. External stakeholders, on the other hand, should include residents, businesses, community associations, schools, Councillors, Business Revitalization Zones and shallow utility providers. By better explaining the long-term goals of the project and why certain trade-offs are made during the developmental stages, we can build better understanding and acceptance of the project design earlier on in the process. In the case of Calgary, for instance, it is helpful to contextualize each project within the 100-year framework of the imagineCalgary Plan, which was created with extensive public consultation. The City of Calgary has not completed any projects under the newly approved Guide; however, we have a number of examples of successful bicycle and corridor projects that owe their success to effective stakeholder engagement strategies. 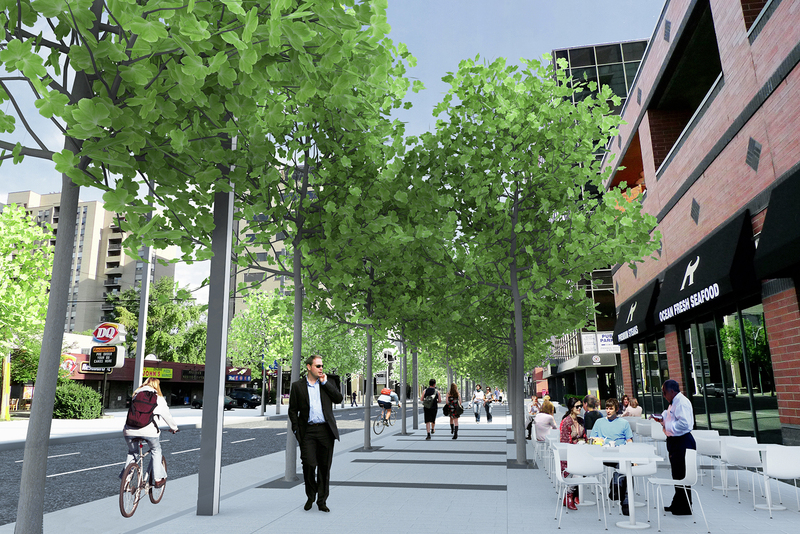 Led by The City of Calgary Planning Department and guided by the Centre City Plan, a corridor master plan complete with enhanced pedestrian realm, cycle tracks, and transit facilities is being created for a nine block stretch of an existing four-lane arterial road on the west end of Calgary’s downtown. Still to be finalized, the project demonstrates a collaborative effort between internal and external stakeholders to meet the original vision of the project (enhanced public realm with street trees) and still allows for the needs of bicycles, transit, and automobiles. Incorporating the needs of all people can be difficult, but through communication and stakeholder engagement efforts, there is an opportunity for varying needs and interests to be heard and incorporated into project designs. Through processes like imagineCALGARY and the Complete Street project engagement, we have seen how understanding stakeholder’s current and future needs, addressing their concerns, and modifying projects as they progress, lead to much higher levels of community and public support. This support will be critical in realizing the imagineCalgary Plan’s long vision of improving transportation choices for the City’s growing population. Joe Olson is a Transportation Engineer who has been with the City of Calgary for 10 years. He currently manages the Liveable Streets division, which encourages Calgarians to use travel alternatives to the car through projects, programs and education. Interested in more Curb content? Subscribe today.